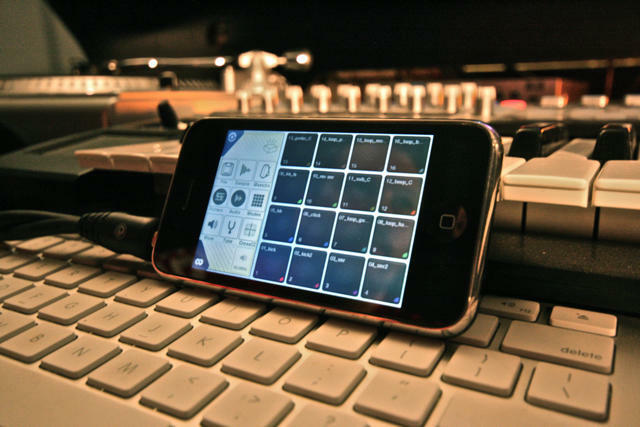 Last week we reported on a director who shot a music video using only three iPhones. Now, Tom Freeman brings an all-iPhone production to the arena of sound with the release of his electronic soundscape, iMatik. Aided by a quiver of powerful sound-production apps, Freeman produced the entire album — from creating the tracks to editing them — on an iPhone 3G. “It turned out really cool, the sound from the iPhone really impresses” Freeman told us, and even compared the sound he managed to squeeze from the iPhone with the quality one might get from dedicated hardware synthesizers. Five apps from iZotope‘s iDrum line became the backbone of his production effort, and sounds created with Sound Warp, an app that allows free-form sound customization, were added to the mix. Flare Scratch handled turntable duties, and used iSkream to produce an modify sampled sounds. Other apps like BeatMaker shown in the photo above, were also employed. Freeman says the next step wasn’t possible on the iPhone. “Because you can’t run two apps simultaneously, I couldn’t overdub.” So he dumped the tracks onto a digital audio workstation, where it was overdubbed and mixed. Freeman compares the sound of his trip-hop DJ mix with stuff from Invisibl Skratch Piklz; I think it kinda resembles work from U.N.K.L.E.’s earliest days a little. Freeman says he’ll dole out download codes to the first five people who email him at freematik@gmail.com; just tell him the Cult sent you. Those who miss out can still listen to the tracks at the iMatik site.